The thing I love most about working from my home studio is the amount of people you can reach, and the amazing variety of clients you are able to work with. With technology such as Skype, Facetime and Zoom, you can get to know your clients and serve them, without being in the same state or country! I love working with all different types of entrepreneurs, and seeing all the new businesses popping up, and so many people just going for their dream. By working from home and marketing my services through social media, I am able to work with entrepreneurs I would've never been able to reach before! Typically my clients find me through a post on Pinterest or Instagram. This leads them to my website, where they can book a 15-minute design consultation online. I give them the option of connecting through a phone call, Skype or Facetime. Once scheduled, I will send over a brief questionnaire to get more of an idea of what type of design services they are looking for. These calls are a great way to get to know each other, and I can learn more about their business. After the design consultation, and my client has decided they want to book my services, we select a start date for the project. This allows my clients to prepare their client homework and Pinterest board, as well as gather their photos and content for their website. At this time I send over access to their "client portal" where they can access their design contract, and pay their 50% deposit to hold their booking date. The client portal also serves as a hub for all of the information that we will exchange during the design process. It has the contract, invoice, and branding proofs for the client to review. I will also share a Dropbox folder, to make it easy for the client to add their brand photos and content for the website. Client Vision Worksheet & Pinterest Board – I start out the design process by giving my clients some brief "homework." It's way more fun than regular homework though! It includes a brand questionnaire for them to complete online, as well as direction on how to create a Pinterest board that is tailored to their vision for their brand and website. I have my clients pin the color palettes, textures and images that are most inspirational to them in what they'd like to see for their brand design. This helps me to create a brand that's consistent to their vision, and from these images I create a Vision Board that will set the tone for the brand, where we decide on a color palette, and photos to draw inspiration from. In addition to that homework, I share a Dropbox folder with my clients for them to drag and drop their photos and content (text documents) for their website. Some clients have had photo shoots done for their brand, while some choose to use stock photos. Once all of the information is completed by my client, I will start the 2-week design process based on their booking date. First of all, I get started sketching. This is where I get my initial loose concepts for the logo design. Once the sketching is done, I get to work designing the main logo in Adobe Illustrator. This process will take roughly 3 days, and I give my clients 3 logo options to choose from. Once my client has approved their main logo, I get started on the sub-logo/favicon, texture and business card design. After that, I get started on any lead magnet or social media designs. This process will ideally take 1 week, upon approval of your designs. Two sets of revisions are allowed per item. Once the branding items are complete, I start to design the website. I go right to work designing in Squarespace. Squarespace is an amazing platform that has a clean, easy-to-use interface, and with some creativity, you can create a stunning website design! I will set up the homepage, all pages requested, and incorporate a sidebar and online shop (if requested). I will implement my client's photos, content, blog and branding materials to give their site a cohesive look. This process will ideally take 1 week. I keep my clients in the loop and posted of my progress via email and send them a link to proof their website. Two rounds of revisions are allowed for the website. We can jump on an additional Skype call if they have any questions throughout the process, or they can feel free to email me with any questions throughout the entire process. Upon approval of my client's website design and all branding items, and after their remaining balance is paid, I will share with them their branding items in a zip folder. This also includes a Brand Style guide, which includes all the helpful information on how to use their logo, typefaces and color palette, and how to use their brand going forward. They will receive all the relevant file formats of their logos, to use as they please going forward. I typically include the following file formats (in color and B&W): .eps, jpg, png, pdf. For their website, I will transfer their domain (or add their new domain URL) and website to their Squarespace account. From there, Squarespace will bill them the monthly (or yearly, if chosen) hosting fee and their site will go live. I will then set up their email with G Suite at this time (if this option is chosen). To wrap up, I send my clients a link to a tutorial that walks them through Squarespace, and how to add blog posts and other information so that they are able to easily update their site themselves! Cheers! We celebrate that their new brand and website is ready to share with the world! I will spread the word by showcasing my client's site and linking to it on my blog and social media. My clients can feel confident going forward that they have a swoon-worth brand and website that will allow them to attract their ideal customer! 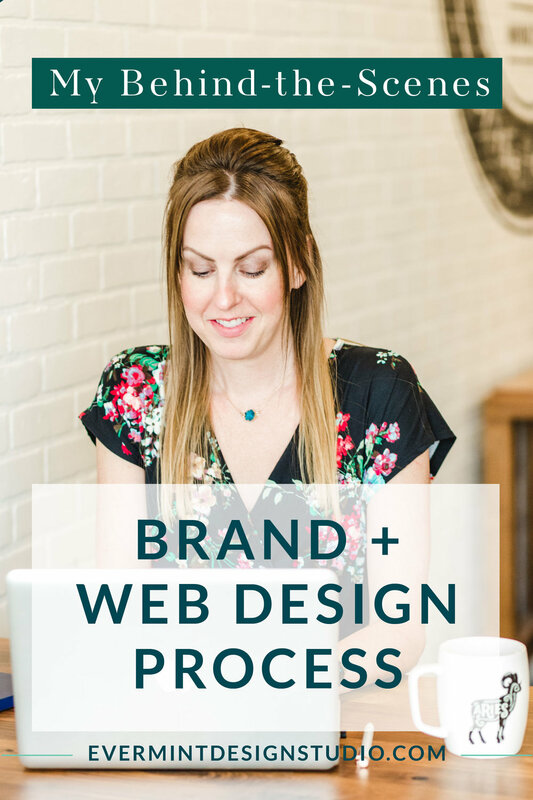 Have any questions on my Branding + Web Design process? Feel free to leave them in the comments! I'd love to hear from you. Are you ready to step up your online presence? Click below to book a Free 15-minute Design Consultation with me, I'd love to chat!